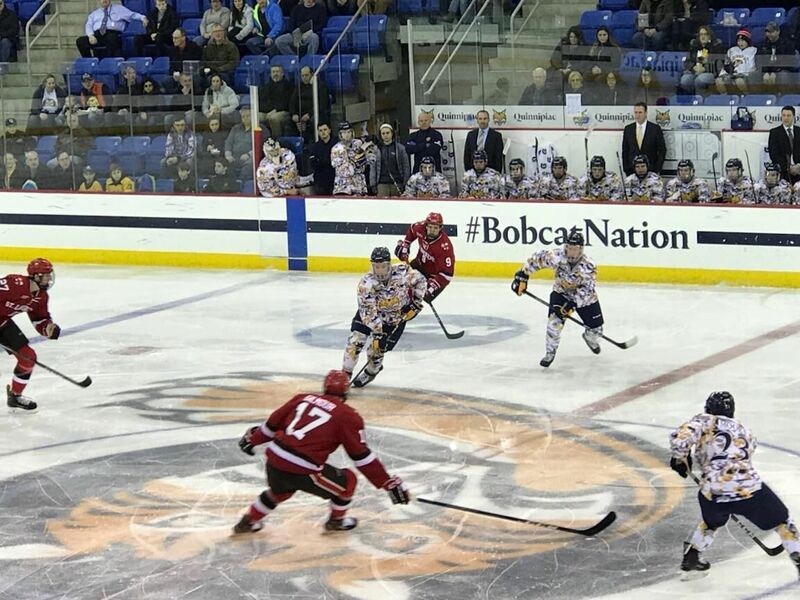 Quinnipiac swept a weekend series for only the third time this season and just second in league play as the offense came alive in a 5-2 win over St. Lawrence Saturday night at Frank Perotti, Jr. Arena. Four players had multi point games for Quinnipiac who scored nine goals this weekend in securing four huge points in league play jumping to 8th place in the ECAC standings with 14 points. "We played with a lot of passion and a lot of care, said head coach Rand Pecknold. It was nice to get the sweep at home this weekend." 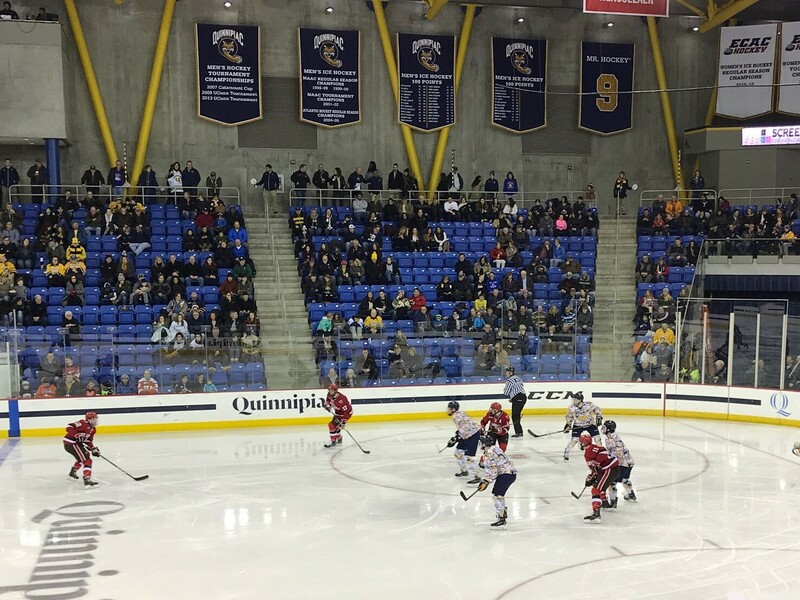 Quinnipiac played one of its best weekends of hockey of the season to improve to 11-13-4. The Bobcats didn't panic when St. Lawrence scored just over five minutes into the first period on a goal by Alex Gilmour. What they did next was take control of the game in the opening period and never looking back. They got the board when John Furgele fed Brogan Rafferty whose big shot changed direction when St. Lawrence forward Patrick Steinhauser's stick got in the way. Quinnipiac's star freshman Odeen Tufto then gave the Bobcats the lead when he went post to post past Arthur Brey. Not even a minute later Chase Priskie's sent a drop pass to Bo Pieper who fired it glove side past Brey. Three plus minutes later it was Pieper again who had to coral a Kevin Duane pass cross ice flipping it high stick side past Brey. "These last few games felt like freshman and sophomore year when we made the NCAA tournament twice and the frozen four once, said Pieper. The passion and confidence play hand in hand and it starts in practice." The two goals by Pieper give him double figures in goals in back to back years. 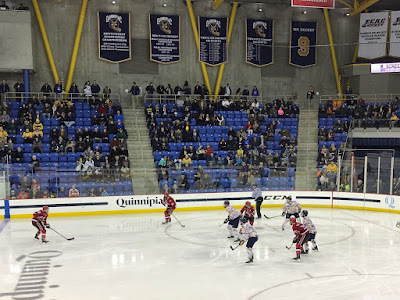 Quinnipiac extended the lead to 5-1 on the power play when Odeen Tufto made a nifty backhanded pass in front the crease to a wide open Rafferty who slid it past Brey. The two goals by Rafferty was only his second multi point game of the season, the first coming back on November 28th against Princeton. "I think everyone has to keep each other accountable, said Rafferty. We have a good group in the locker room and this weekend showed it." St. Lawrence added a goal in the third period by Alex Gilmour as they fell to 6-20-2 on the season. "It was a good weekend, Pecknold said. This is what we should be doing every game and it's how we played the last seven or eight years but we will see how play next weekend." Odeen Tufto had another multi point game (1 goal, 1 assist) and his fellow freshman teammate Matt Forchuk had the first multi point game of his career (2 assists). Andrew Shortridge made 22 saves for Quinnipiac who now travel to Yale and Brown next weekend.